"The Civil Aviation Authority of Burundi (AACB) positively appreciates the support that CASSOA has consistently provided to Burundi through its many assistance missions, especially during the preparation of security and security audits. 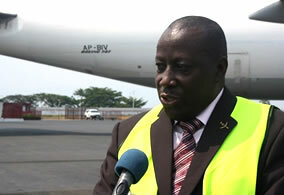 Civil Aviation Security ", Emmanuel Habimana, Director General of the Civil Aviation Authority of Burundi. The Minister of Transport, Public Works and Equipment Jean Bosco Ntunzwenimana animated Thursday, December 06, 2018 a press briefing after a visit he made in different departments of the Civil Aviation Authority of Bujumbura (AACB) ). From June 27 to 29, 2018, Burundi hosted the 44th subregional meeting of the East African Community on the facilitation of air transport. This meeting of the EAC civil aviation partners was part of a framework that reviews the recommendations made at the previous meeting, said the Director of the Civil Aviation Authority of Burundi (AACB). ), Deus Niyonkuru. In response to the need for visibility of the services of the AACB, a redesigned version of the website of this institution is available. This version is not only for visibility or advertising missions, but also for a certain level of remote services that is generally referred to as e-service. The website in this version will allow our partners who need, for example, forms of our services to download them from elsewhere without having to meet the obligation to come physically to our offices to receive them. Other options appropriate and adapted to the current level of exploitation of Information and Communication Technologies in general and particularly for the services of the AACB will be provided gradually.